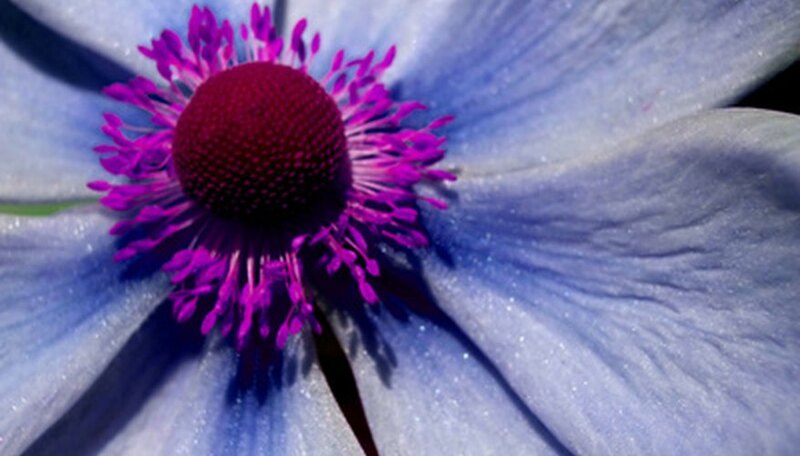 Anemone is a versatile plant in the garden. Purple, pink and blue anemone blanda blooms in spring, and white Japanese anemone blooms in late summer and fall. Anemone are sold as a spring or fall bulb, but they actually grow from a tuberous root system. Plant spring-blooming anemone in fall, approximately six weeks before the first expected frost. Plant fall-blooming varieties in spring once all frost danger has passed in your area. Fill a bowl with lukewarm water. Place the anemone bulbs in the bowl and soak overnight the evening prior to planting outdoors. Lay a 2-inch layer of compost over a full-sun, well-drained garden bed. Till the compost into the top 8 inches of soil to add nutrition and aid drainage. Plant the anemone 2 inches beneath the soil surface. Position them so the buds, which resemble the eyes on a potato, are facing upward. Space the anemone 4 inches apart in clusters. Water as needed to keep the soil evenly moist throughout. Stick your finger into the soil and water when the top 4 inches begins to feel dry. Lay a 2-inch layer of mulch over the bed after planting. Mulch protects fall-planted anemone from temperature fluctuation and prevents weed growth in summer anemone beds. Mulch also preserves moisture in the soil. Anemone can withstand partial shade. Pick a bed that provides morning sun and afternoon shade. Intersperse other spring bulbs, such as tulips or daffodils, in the anemone bed. The cultural requirements for spring bulbs and anemone are similar enough that they can be grown successfully together. Anemone does not withstand wind well. Plant in a sheltered area, such as near a building or fence. Anemone often need to be replaced every two to three years, particularly in colder regions where winter wind-burn shortens the life of the plant.